REVIEW - The Coma - Use a Potion! The horror genre as a whole is well trodden territory , the horror movie market feeling a little saturated with the same old tale of a ‘slasher out for revenge’ or ‘home haunting’ being re-told on an all too regular basis – even the classics are seeing the reboot treatment with production companies facing a severe lack of original ideas. The same can be said for video games; the popularity of ‘petrified’ You Tubers yelping at every bump in the night has spawned a plethora of first person horror titles hitting Steam. Unfortunately, a lot of them have started to feel the same – it’s not due to a lack of quality but rather a lack of originality and a high dependence on jump scares. I’m not complaining – I’m a huge fan of the horror genre so the constant titles are a treat for me. It just feels like I’m playing the same thing over and over. 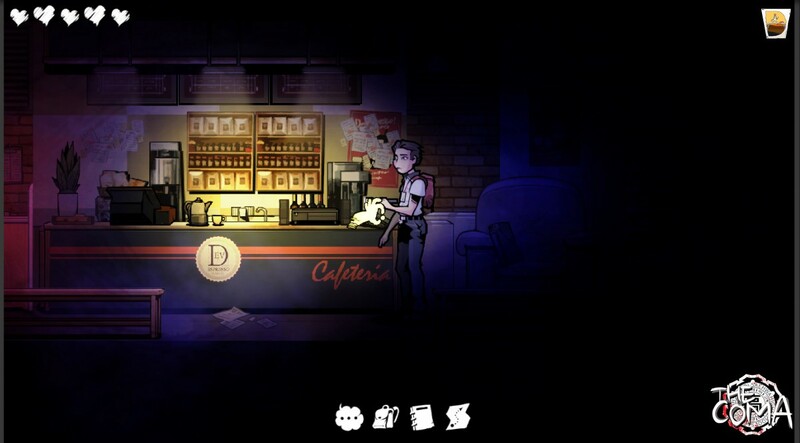 That’s why titles like The Coma, a 2D survival horror game from Korean developers Devespresso Games, are such a breath of fresh air. Don’t get me wrong, it features a lot of the standard horror movie tropes that we’ve seen elsewhere (a creepy school, a gruesome pursuer) but it delivers them as an enjoyable, refreshing package. The Coma places you in the role of Youngho, a high school student facing the stress of exams as he approaches the summer break. Whilst heading into school he notices a commotion due to a student leaping to his death; an apparent suicide under mysterious circumstances. When the crowd clears, he discovers a pendant on the floor belonging to one of his teachers. He intends to give it back, but before he can he has to take his exam. With the stress of revision keeping him awake the night before, Youngho can’t help but to fall asleep during this exam. He awakens startled and confused – even more so considering his school no longer seems to be the same, instead replaced by an abandoned, horror filled death trap with a killer on the loose out to get him. It’s a familiar premise, but the story contains plenty of mysteries to keep you intrigued through-out. There are constant twists and turns and there are even a few clever ideas that really shine through. There are plenty of notes littered around the school that offer both a bit of back story to the mystery along with a few details about the relationships between characters. 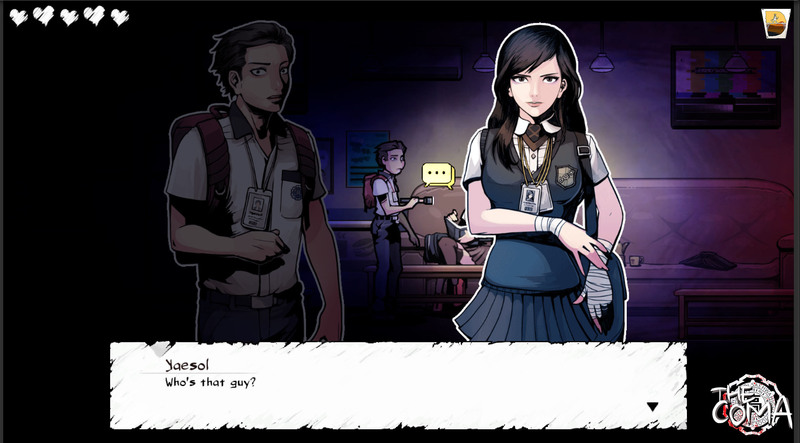 Although the random appearance of notes isn’t unfamiliar to fans of horror games, The Coma goes out of its way to introduce a mysterious character who places them throughout the school. It offers a sense of context and realism – it’s a really nice touch. One particular area of the story that particularly stood out was the character development and script. Admittedly, the cast mainly consists of high school stereotypes (you have your bully, your nerd, your attractive teacher) but there are a few stand out cast members – particularly the aforementioned note placing mystery man and the demonic character known only as ‘The Shade’. Conversations between characters are great – there’s sarcasm and wit shared between characters, with each conversation having a really natural feel to them. They’re a pleasure to read through and you’ll look forward to each interaction. One thing I could particularly appreciate was the reaction Youngho had to the horrors around him; so often in horror games characters just accept that there are ghosts or monsters surrounding them. 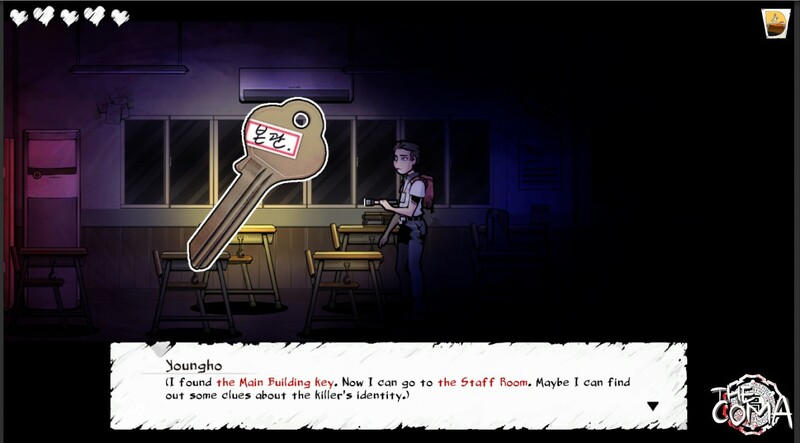 In The Coma, Youngho questions the things that are happening and actually shows a real sense of fear. It’s impressive how well developers Devespresso Games have managed to convey the emotions of the characters in the game. Exploration in The Coma takes place across a 2D plane with an abundance of rooms for you to investigate. Whilst you’ll find a ton of locked doors à la Resident Evil to begin with, the further you progress through the game the more areas you are able to access. The main bulk of gameplay will consist of exploration; you’re constantly tasked with finding new items in order to progress. Whilst exploring these abandoned class rooms may seem easy, you’re also facing a gruesome pursuer who wants nothing more than to see your guts unleashed through the use of her axe. It wouldn’t be a horror game without some evil pursuer, would it? In The Coma, that pursuer is a horrifying twisted form of one of your school teachers – she’s no ‘Pyramid Head’, but you’ll still dread the sight of her. You’ll constantly find yourself being hounded and your only option is to run and hide – there’s no combat here. You’ll head from room to room trying to hide, seeking solace in wardrobes and toilet cubicles. Once hidden, you’re pretty safe; unless you’re seen entering your hiding place it’s just a case of waiting until your pursuer leaves you alone. These pursuits can be really intense and add to the fear factor, with every successful evasion giving you a brief moment of respite. Running uses stamina, so you’ve got to be careful not to let your stamina bar drain completely. Fortunately, being caught doesn’t result in instant death but instead sees you lose one of your health points. Both can be restored through the use of the many items you’ll find throughout the school, so it’s pretty easy to keep alive – the better alternative is to escape though. That’s one issue I had with The Coma – it’s difficult to escape. Sometimes you’ll need to enter a particular room for story progression, only to find your pursuer is lingering in that area. They’ll spot you and you’ll lose them – only when you return to that room they’re back there, repeating a constant game of cat and mouse. Whilst the pursuits are a key gameplay feature, it could sometimes feel a bit unfair. Gameplay mainly consists of collecting items ranging from keycards to missing pieces of homework. There are no clever puzzles to solve here – don’t expect to face too much of a challenge. It’s a shame actually, as a few puzzles could’ve added a bit more variety to the gameplay. It’s instead a constant feeling of fetch-quests; something that may put off some players. The Coma never felt boring to me though – sure, you tend to spend a lot of the game doing the same thing but the school is such a pleasure to explore you really won’t mind. The high school feel is re-created perfectly; there are classrooms full of desks littered with books, computer suites with PCs riddled with the blue screen of death and biology classrooms with displays of the human anatomy – literally. This is a horror game after all, and there is plenty of blood and guts to be seen. You’ll find hanging bodies, bodies that have been dislodged out of place, huge piles of bodies – I’m sure you get the picture. 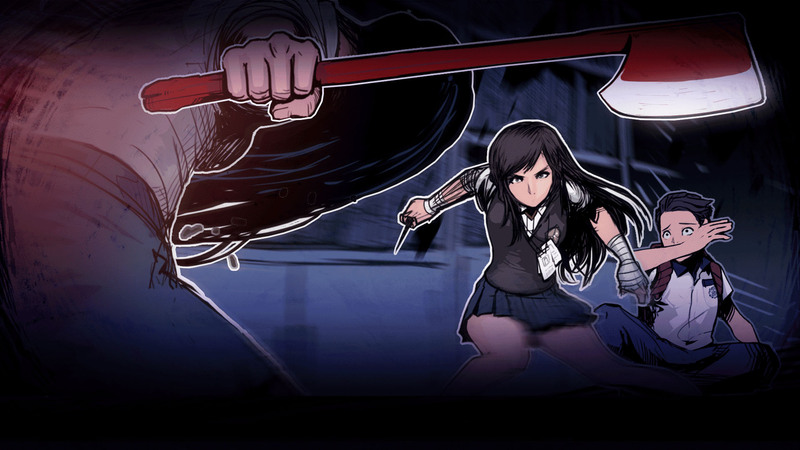 The Coma has created a horrifying vision of a school and it’ll leave you both engrossed and grossed out – a lot of this thanks to the fantastic art style. The Coma looks amazing. The 2D visuals evoke a comic book style with characters featuring a hard black outline. Character design is fantastic; whilst they adopt the appearance of the previously mentioned stereotypes they still look great. Characters are animated fluidly in-game too – you’ll notice little details like the dread on Youngho’s face as he runs in fear, glancing behind at his pursuer. It’s these tiny details that show the care Devespresso Games have put into The Coma. The same attention to detail has been given to the environments; they’re so packed full of detail with a great amount of variety within them. There’s not a constant recycling of rooms, but instead uniquely designed locations that feel like they actually belong in a high school. It may be dark and grim with the only real light coming from your flashlight, but this is a horror title – you wouldn’t want it any other way. The sound design is highly effective at setting the atmosphere alive. Whilst there’s typically ambience noise and eerie tunes that set an unsettling tone, when in pursuit you’ll have a more terrifying, upbeat piece that conveys the urgency of your situation. There’s good use of sound effects too – you’ll know when your pursuer is nearby by the sound of her axe dragging on the floor or her heavy footsteps. There’s so much on offer with The Coma – you have a great story that’ll keep you intrigued all the way through, fantastic environments to explore and amazing graphics. Whilst it does lack variety in its gameplay, you won’t feel bored through your three to four hour adventure. What’s more, there are a few optional objectives to complete along with multiple endings to unlock – you won’t see everything The Coma has to offer in one playthrough. 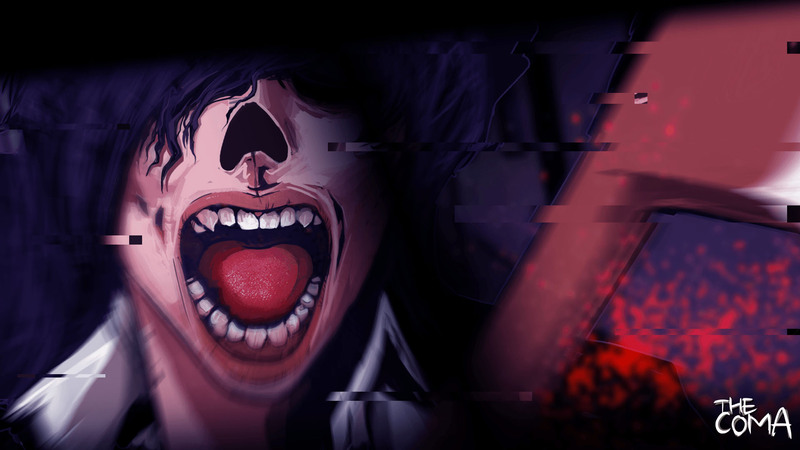 The Coma doesn’t re-invent the wheel with its horror-centric gameplay, but it still feels really refreshing; there’s plenty of style at no expense of the substance. I’d recommend any horror fanatic give it a try – it’s here just in time for Halloween after all.